In early 1995, I was working at Microsoft as an intern software engineer on the Windows 95 team, and was approached to write the music for the hidden Windows 95 Easter Egg. 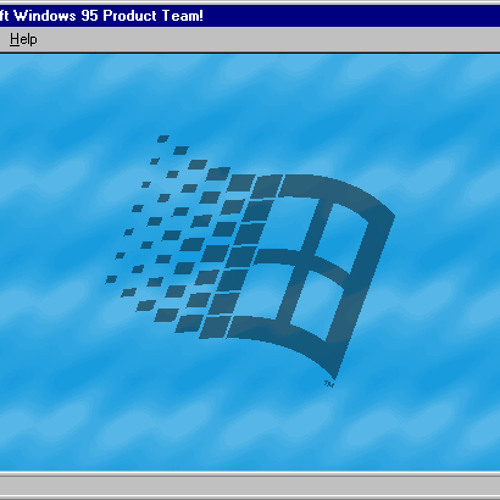 This ‘Easter Egg’ was tricky to find, but once found it opened up a window with all the names of who worked on Windows 95, with my music as the theme. The only instructions I was given was that the music should invoke images of ‘clouds’ and feel ‘floating’ and ‘peaceful’ – this is how Windows 95 was going to be marketed. Well, and that it had to play well on all sound cards at the time. For 99.9% of computers, this meant through the Adlib synthesizer emulation of the Creative Labs Sound Blaster card (or equivalent clone). In other words – no sampled instruments, no effects – just simple FM synthesis. General MIDI at it’s finest. With that said, I really couldn’t do too much in terms of interesting instrumentation or sounds. I’ve rendered it out using a GM sound module (which is better than the Adlib synthesizer) but still doesn’t come close to the realism you’d expect from most computer music today. Enjoy! @sionnarch Thanks for the comments! Yes, the panning was in the MIDI file. The version of Cakewalk I used was from around 1994/1995, before the digital audio features were added. @brianorr: thanks for answering! I currently use fl studio for midi shenanigans but i'm told that it's not very good. @wobuffet3: I wrote it in Cakewalk. I can't remember the version number, maybe version 3 or 4? Can we have the Adlib version as well? I liked it better, sounded more 90s. @pandacreeper: http://www.brianorr.com/blog/?p=21. There's a link to download the MP3. You can find the MIDI file on my website as well.